The late great, Italian cookbook author Marcella Hazan, who passed away at 89 years old last weekend, had a profound effect on the way Americans approached Italian food. I’m no exception. Throughout my life, despite efforts (and threats) by my Italian-born mother and grandmothers, I was completely indifferent to cooking. I loved to eat. I loved good food. I especially loved good (as in real) Italian food. However, I had no idea how to cook and little interest in learning. I became engaged to my husband while I was in law school and like two kids in a candy store, we abused our “zapping gun” and registered for the best kitchenware and gadgets Williams-Sonoma and Crate & Barrel had to offer – Le Creuset, All-Clad, Wustof, Mauviel, etc. I recall hearing my dad’s cousin Dora remark at my bridal shower, “Wow, she got a lot of kitchen stuff. She must really like to cook.” I then heard my mother sneering behind me. Right after our honeymoon, my new husband and I moved into an apartment in Chelsea and I started my job as a first-year associate at a large Manhattan law firm. I began working 70-hour weeks in a stressful post-9/11 economy and it didn’t take long before I felt jaded by the long hours and lack of personal fulfillment of corporate law. My beautiful new kitchen equipment remained untouched as I ordered take-out to the office nearly every night. At the same time, however, any time I needed a break from document review and SEC compliance checks, I found myself surfing the Internet for Italian recipes. 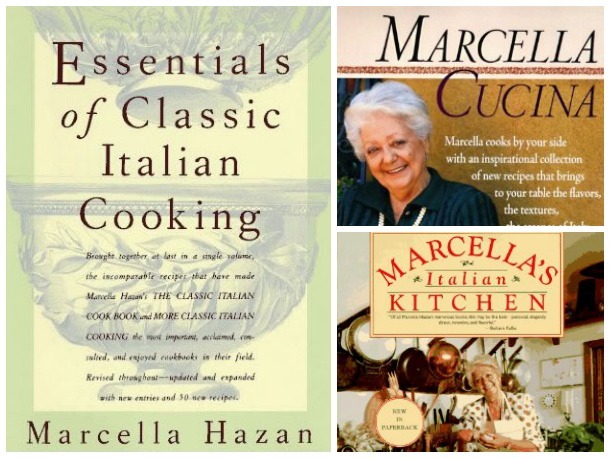 One day, I searched, “best Italian cookbooks” and that’s when I discovered Marcella Hazan. I ordered “Essentials of Italian Cooking” online and had it delivered right to my office. I remember the day it arrived – its light green cover, which has since become oil-stained and tattered, was shiny and creaseless. No glossy, over-styled photos – just a few diagrams and illustrations to support Mrs. Hazan’s meticulous instruction and fluid prose. I carried that volume back and forth to work every day and read it on the subway, during lunch breaks and at bedtime. Mrs. Hazan, with her insistence on simple techniques and fresh ingredients, got through to me in a way that my poor mother never succeeded despite their shared cooking philosophy. I finally broke out the new cookware, with Marcella as my guide. Cooking – Marcella Hazan’s brand of honest regional Italian cooking – became my singular release from a stressful, unsatisfying career (a career I would eventually give up years later to do the very thing she taught me to love). For one of the first dinner parties I ever hosted, I prepared Mrs. Hazan’s “Braised Carrots with Capers,” a side dish I’ve served at every holiday and event I have since hosted. Simple, thoughtful Italian food – the very epitome of Marcella Hazan. La ringrazio dal cuore, Signora Hazan. Riposi in pace. Peel the carrots and wash them in cold water. They ought to be no thicker than your little finger. If they are not that size to start with, cut them in half lengthwise, or in quarters if necessary. Choose a sauté pan that can accommodate all the carrots loosely. Put in the olive oil and garlic and turn on the heat to medium high. Cook and stir the garlic until it becomes colored a pale gold, then add the carrots and parsley. Toss the carrots once or twice to coat them well, then add 1/4 cup water. When the water has completely evaporated, add another 1/4 cup. Continue adding water at this pace, whenever it has evaporated, until the carrots are done. They should feel tender but firm when prodded with a fork. Test them from time to time. Depending on the youth and freshness of the carrots, it should take about 20 to 30 minutes. When done, there should be no more water left in the pan. If there is still some, boil it away quickly, and let the carrots brown slightly. Add pepper and the capers, and toss the carrots once or twice. Cook for another minute or two, then taste and correct for salt, stir once again, transfer to a warm platter, and serve at once. Michelle – She was one of the greats, no doubt about it. I have a couple of her books too, but have never made this carrot recipe. Now I will. And I loved reading about your evolution from corporate lawyer to cooking. 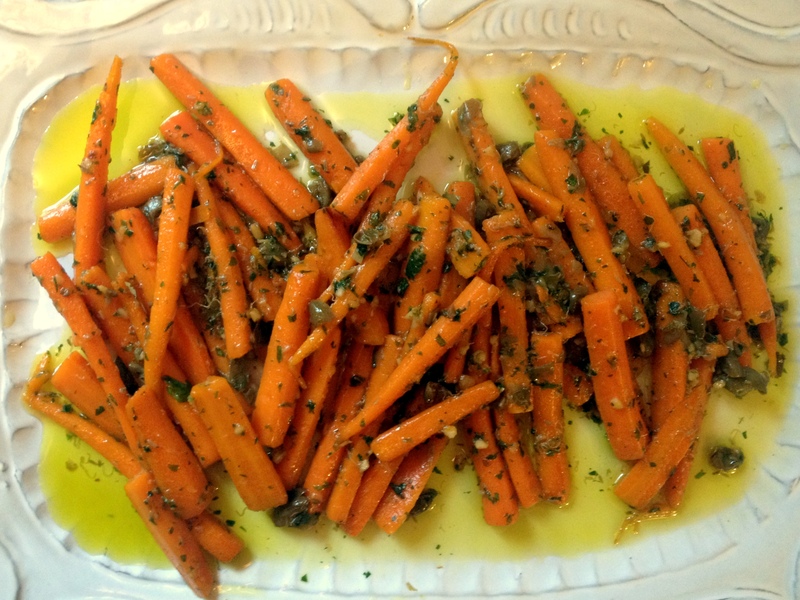 Linda, this carrot recipe is pure genius – as are so many of Marcella’s recipes. I remember serving it at my first “grown-up” dinner party in my studio in Manhattan when I first started practicing. I was such a mess in the kitchen but was certainly determined! What a sweet tribute to Marcella. It’s incredible to think how many people she inspired over the years ~ generations, really ~ with her books. As for all that cooking equipment, you must have known at some level in your subconscious that it would one day be put to good use. Clearly you’ve made the right decision, my friend. She is truly a treasure, Domenica….I wish I could have met her. Funny enough, years ago when I was practicing, she gave a three-day class at a cooking school in NYC. I desperately tried to get the time off so I could attend but I couldn’t get away from work. I’ve always regretted that. Really from the cuore, Michelle, what a lovely way for you to remember this lady who taught you to love and cook the food of your heritage. It’s truly amazing what can happen if we follow our hearts & passion! You’re proof! Thank you, Phyllis. That’s the highest compliment you could give me. As another lawyer who has found personal fulfillment in the culinary arts, I really appreciate your tribute to Marcella. I’m a bit older than you are, and I discovered her back in the early 1980s, when she had just burst on to the scene. The excitement her book created, not just for me but, obviously, many others, was palpable. Other than that, thought, your story sounds very familiar… I was working as an associate in a large New York firm. I discovered Marcella more or less by accident, browsing for cookbooks at a book store in Grand Central. When I leafed through hers—the original edition of her first cookbook—I immediately knew I had hit pay dirt. I still have that book to this day, although the pages have gone dark and brittle, I still open it up once in a while and remember when all of this was still new. She was one of the great ones. As another lawyer who has found personal fulfillment in the culinary arts, I can really identify with your tribute to Marcella. I’m a bit older than you are, I suspect, and I discovered her back in the early 1980s, when she had just burst on to the scene. The excitement her book created, not just for me but, obviously, many others, was palpable. Other than that, thought, your story sounds very familiar… I was working as an associate in a large New York firm. I discovered Marcella more or less by accident, browsing for cookbooks at a book store in Grand Central. When I leafed through hers—the original edition of her first cookbook—I immediately knew I had hit pay dirt. I still have that book to this day, although the pages have gone dark and brittle, I still open it up once in a while and remember when all of this was still new. She truly was one of the great ones. Isn’t is fascinating how many of us (as in attorneys) there are walking around looking for something inspiring? Leaving the practice of law was one of the most difficult decisions I’ve ever made but I’m infinitely happier as caterer and aspiring food-I-don’t-know-yet! I like to think that Marcella has been with me every step of the way, teaching and inspiring.